Roasting fresh tomatoes and peppers and topped with a tomato cream sauce and baked until bubbly. 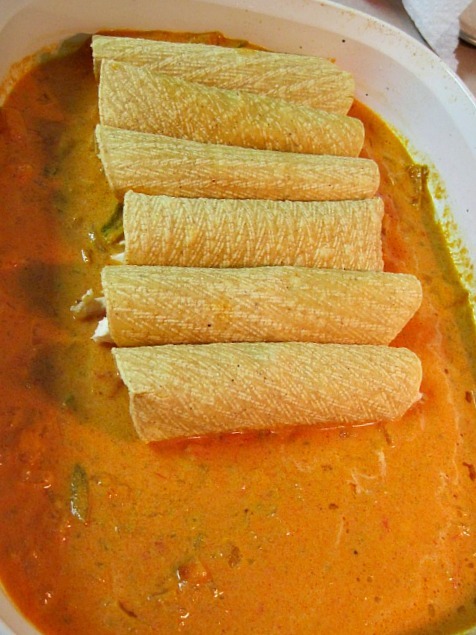 Try our favorite chicken enchiladas with Tomato Cream Sauce recipe. Today we’re cooking indoors, using our indoor voices, because it’s 19 DEGREES in Denver. I didn’t know traditional fall colors of gold, rust, and yellow would also include white. Yes, a dusting of snow covers my beautiful summer, now dead, flowers. They’ve even cancelled the Rockies Playoff Game tonight because of inclement weather. We’ve gone from Summer, one week of Fall and smack dab into Winter. I doubt Alaska has even dipped below 20 degrees yet this year. Puff the Magic Weber didn’t even have time to frolic in the Autumn mist, he’s all icy. Before we get started, I’d like to climb on my soapbox and talk a little about Mexican Food. I love Mexican food. I’m NOT a fan of Americanized Mexican food joints. You know those places that bring you a huge plate of steaming greasy glop that’s covered in two cups of a greasy melted yellow cheese product covering up greasy fried ground beef that’s wrapped in a greasy fried white flour tortilla served with a side of odd looking bland tasting creamed beans also served with melted cheese…Messy and gross. There, I’ve said it and I’m glad I did. Let’s talk about authentic Mexican Food. I’m a big fan of Rick Bayless, who has spent many years living in Mexico and brings to us his fresh, delicious creations inspired by authentic Mexican cuisine. The following recipe is adapted from a recipe I found in one of his cookbooks. I’ve included an affiliate link for your convenience. First, let’s make the tomato cream sauce. 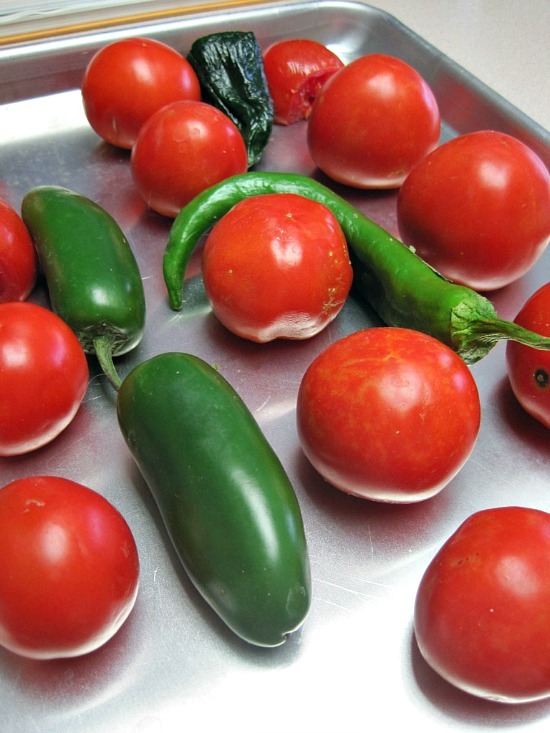 Place about 15 medium sized tomatoes and 2 jalapeno peppers on a baking sheet. Broil in oven about 5 inches from heat for five minutes. I threw in one little Anaheim pepper. 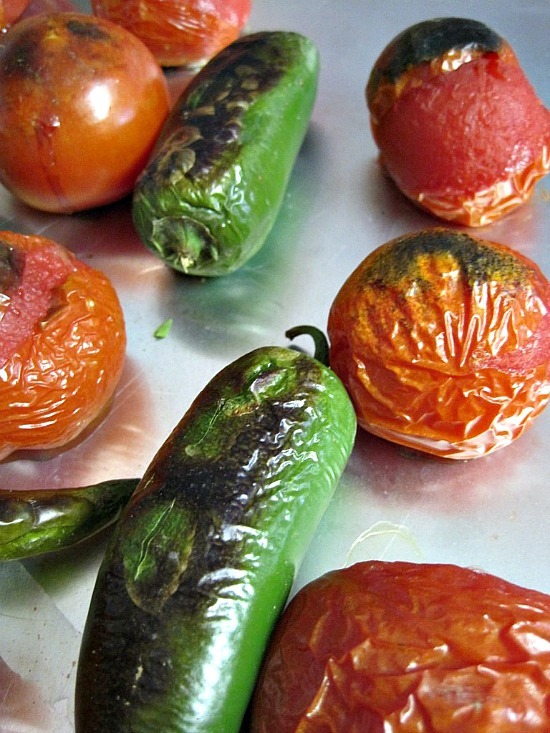 You can also use canned tomatoes, which skips this step altogether, but you’d still need to roast the jalapeno. I would suggest when in season, use fresh tomatoes and this method. When you start to see charred spots, turn the tomatoes and peppers over and broil another 5 minutes. Remove from oven and cool. Working over the same baking sheet, remove skins and cores from the tomatoes and remove skins from the peppers. I’m a fraidy cat so I also removed veins and seeds from the jalapeno. Leave them if you like the heat. 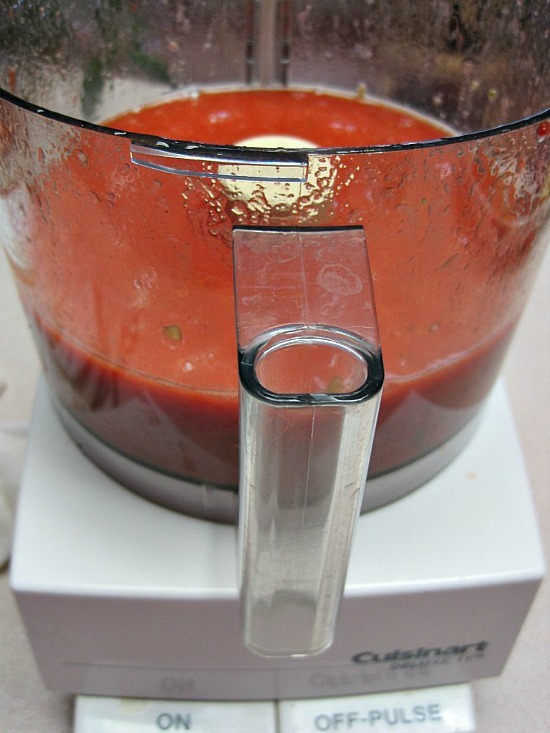 Place tomatoes and peppers along with the juices from the baking sheet into a food processor and puree. 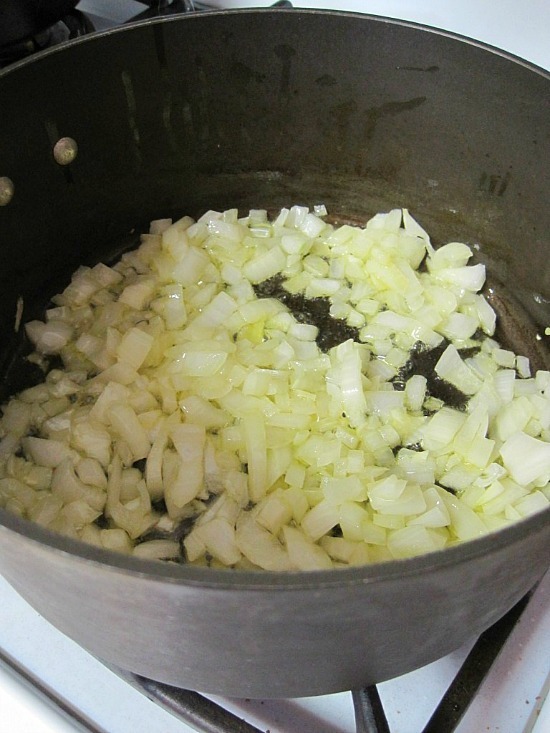 In a Dutch oven saute one chopped onion in olive oil until tender, about 7 minutes. Lard or bacon fat is better here. Turn up heat to medium high and add pureed tomato/chili mixture to onion. Add chicken broth. Partially cover and simmer for 15 minutes. When done, texture should be soupy. If too thick add a little more broth. Add 1/2 C. cream, set aside and keep warm. Meanwhile, coat three boneless, skinless chicken breast halves in olive oil and roast for about 30 minutes at 350 degrees. Cool and shred the meat. Set aside. 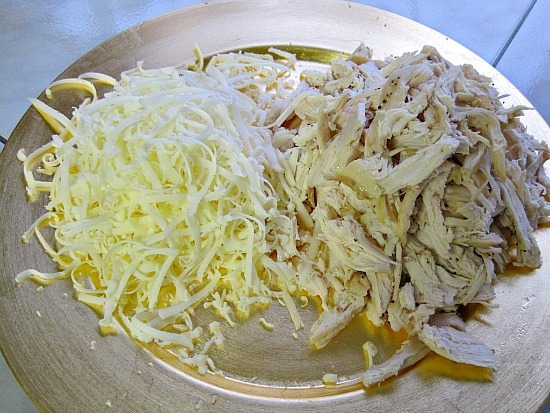 Grate two cups of Monterey Jack cheese. I prefer Mexican melting cheese, but Safeway doesn’t offer the brand I like and I didn’t want to make a special trip up to Whole Foods. So, Monterey Jack it is! 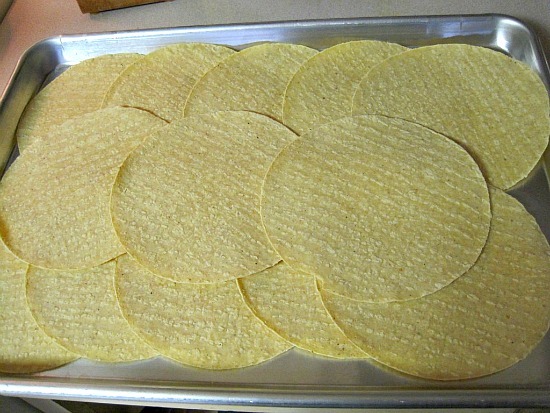 On a baking sheet, place 12 corn tortillas. Bake for 5 minutes. Remove from oven and cover with a towel to keep warm. Spoon 1/2 of the tomato cream sauce into a baking pan. Working fast, so tortillas don’t cool, place shredded chicken inside a warm tortilla and roll. Start placing enchiladas seam side down into the sauce. Spoon the remaining sauce over the enchiladas. Sprinkle with Monterey Jack Cheese. Bake at 350 degrees for 15 minutes or until bubbly and cheese just starts to brown. You’ve got yourself some creamy chicken enchiladas with a beautiful tomato sauce. To serve, place Enchiladas on a plate, garnish with onion rings and cilantro. These seriously are the best chicken enchiladas ever. And it’s all due to a very special (and easy) homemade tomato cream sauce that will knock your socks off. For canned tomatoes: In a small dry skillet, roast the chiles over medium heat, turning regularly, until they're soft and splotchy-black, about 5 minutes. 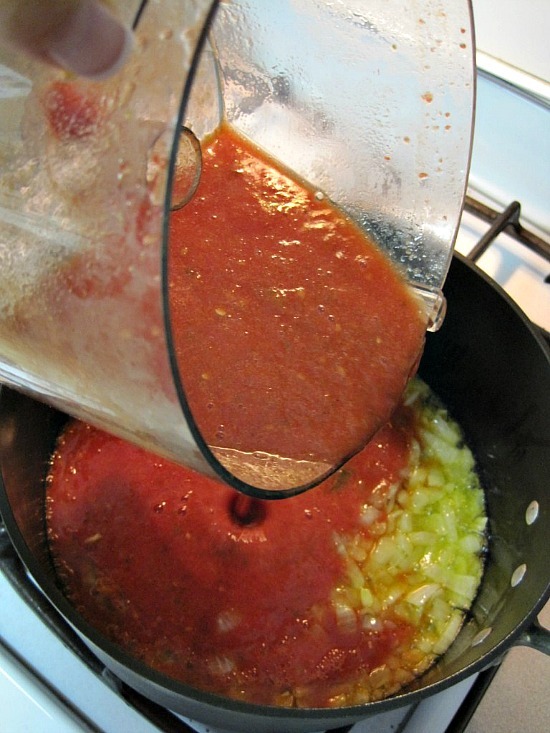 Place in a blender or food processor along with the drained canned tomatoes. Blend to a smooth puree. In a medium-size (4- or 5-quart) pot (preferably a Dutch oven or Mexican cazuela), heat the oil or lard over medium heat. Add the onion and cook, stirring regularly, until golden, about 7 minutes. Raise the heat to medium-high, and, when noticeably hotter, stir in the tomato puree. Cook, stirring, until darker in color and thickened to the consistency of tomato paste, about 10 to 15 minutes. Stir in the broth, partially cover and simmer 15 minutes. Taste and season with salt, usually about 1/2 teaspoon. The sauce should be a slightly soupy consistency—not as thick as spaghetti sauce. If it is too thick, stir in a little additional broth. Keep warm over low heat. Other preliminaries. Stir the crema (or one of its stand-ins) into the sauce. Put the chicken in a bowl and stir 1/2 cup of the sauce mixture into it. Taste and season with additional salt if you think it needs it. Have the cheese at the ready. Heat the oven to 350°. Smear about 1/4 cup of the sauce over the bottom of 4 to 6 nine-inch individual ovenproof baking/serving dishes or smear about 1 cup of the sauce over the bottom of a 13x9-inch baking dish. Lay the tortillas out on a baking sheet (2 sheets if you have them, for more even heating), and lightly brush or spray both sides of the tortillas with oil. Bake just to warm through and soften, about 3 minutes. Stack the tortillas and cover with a towel to keep warm. Working quickly so the tortillas stay hot and pliable, roll a portion of the chicken into each tortilla, then line them all up in the baking dishes. Douse evenly with the remaining sauce, then sprinkle with the cheese. 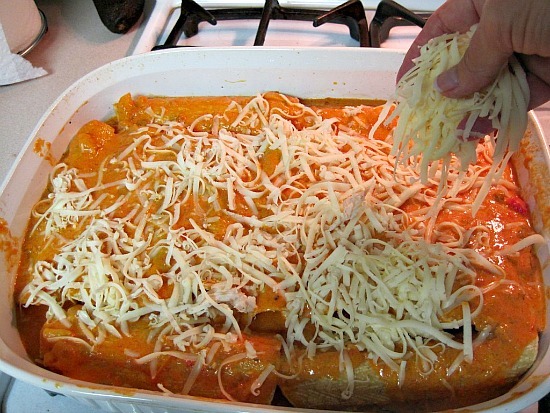 Bake until the enchiladas are hot through (the cheese will have begun to brown), about 15 minutes. Garnish with onion rings and cilantro sprigs. These are best served piping hot from the oven. We paired this with a Borsao Ciranza. It has a cherry red color with touches of garnet and an elegant, deep ruby background. In the nose, we perceive its great intensity where fruity and varietal tones are combined perfectly with vanilla and smooth oak tannins. Intense in the mouth, fleshy and well-structured with an ample and pleasing aftertaste. (I didn’t write that, that comes directly from the web site – but yes “what they say”). I love enchiladas! Those look wicked good, love that sauce. The store I go to doesn’t carry any decent Mexican cheeses, I always use Jack. Pepper Jack is good for it, too. I agree, if used in moderation, Monterey Jack is just fine. Love Pepper Jack. That would have been great for this dish. Thanks for the visit to my blog. Look forward to getting to know you and your blog better. I am so jealous of the cold weather that you are experiencing. I am still waiting for a break in this heat. I love Rick Bayless, great authentic Mexican food. Your recipe looks fabulous. 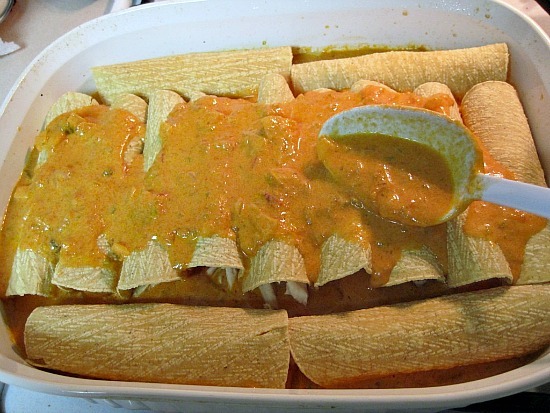 A good bottle of wine to enjoy with these enchiladas, just brings it to a new level. Thanks for sharing this recipe. Oooooooh! Just…ooooooooooooh! Those enchiladas are amazing! What a fabulous recipe! I’ll have to try it one of these days. 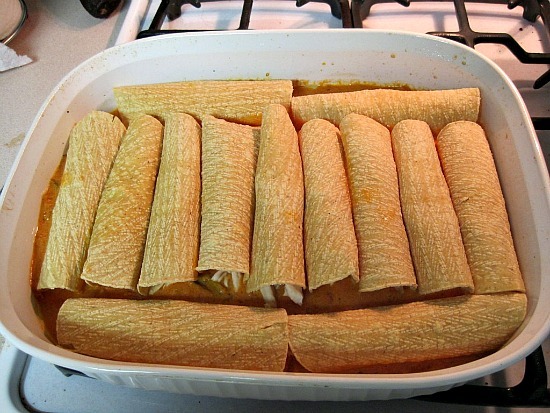 These are some gorgeous enchiladas–they look so fresh and delicious! Get yourself a Rick Bayless Cookbook. He’s got fabulous recipes. 19 degrees!!???? ?/ woah baby, that’s freeeeezin! It was 95F yesterday in FL almost about died it was so damn hot. Yikes 95 degrees with your humidity doesn’t sound like much fun. You really do have a steamy kitchen! Mexico is a pretty large country, with different cuisines- some not spicy at all.. That looked delicious! Wow those look good! I like the idea of adding a little cream to the sauce. After reading one of Rick’s books I got a cast iron griddle so I can brown the veggies on the grill. we’ve got a dozen or so tomatoes sitting on the counter right now, so I’ll have to give this recipe a try soon. I’m a huge Bayless fan. I’ll have to get cast iron griddle. Sounds like a “must have”. I’ve had great luck with it and it works on a stove or grill. Perfect. I’ve added it to my Christmas Wish list. Thanks for the suggestion. Thanks Steph. And as always, thanks for stopping by. i had the exact same opinion of Tex-Mex (and in fact plain ild Mex), til my neighbor moved in about a year ago. Amazing flavors. Nothing like the glop you described (and I had). I think I’m going to move to your street, you folks are so “culinary”. Thanks YOG – always glad you stop by. Wow. Now the tomato cream sauce I just made yesterday sounds soooooo lame. The enchiladas look mouth watering. Yeah right, I’m sure your tomato cream sauce was lame! You cook up some good stuff!!! Those enchiladas look so good! Thanks Kevin. One of those “can’t stop eating” recipes. The cilantro and onions are very important as garnish. For some reason we don’t seem to get corn tortillas up here. Ah snow! I hate it… and I am sorry for you because you already had some :(. I love your enchiladas. What a great way to cook mexican! Actually I love our big snow storms. It just seems too early for it to be this cold. Thanks for stopping by. I have a confession to make. It’s a little embarassing, but we are all friends here, right? I don’t like corn tortillas. I’m serious. But wait, it gets worse. You know the corn flour used in a ton of Mexican cooking from corn tortillas to tamales? Don’t care for it. It’s actually quite depressing. But I have made enchiladas with flour tortillas, and they are “ok”. Maybe your recipe will save me. Maybe, just maybe, I can change “sniff”. Thanks!!! However, doesn’t even come anywhere near as outstanding as the things you create! Thanks for stopping by. I can’t believe it’s really that cold already! I am SO not looking forward to winter. I am with you on the Tex-Mex front. The thought of it makes my stomach churn. I don’t think I could eat it anymore, actually, without feeling physically ill.
Rick Bayless’s food, on the other hand, is so fresh and delicious. Mexican at it’s best. I love this chicken enchilada recipe. The tomato cream sauce is the perfect addition. Yea Joanne! Thanks for the reply. It even bothers me when people refer to those places by saying “Let’s go for Mexican”. That was one pretty salad and yummy lookin enchiladas. Rick Bayliss is one of my food heroes. I have all his booka and someday will go to his restaurants. You are going to have the winter to dream abou barbequing. I am pretty spoiled. My barbeque can be used all year long. The climate in the East Bay is moderate with no extreme weathor. The patio is covered if it rains. I have four of his cookbooks. I need to inventory and place remaining ones that I don’t have on my Christmas List. I’ve not been to Chicago, but will make a trip someday for his restaurants. My patio isn’t covered, but I do grill nearly year round. There’s just those icy days that I say “phooey on that”. The salad was fantastic. I love fruits and greens with a great dressing. All this time and I never knew you had a blog…. it’s terrific! I will most definitely add you to my blogroll…. PS… don’t forget to emil me your contact name and address so I can have Country Bob send you your prize! I only wish I could eat at his restaurants. Yes, his cookbooks are a must. Oh man you did these Enchiladas right! You should give it a try, it’s delicious. And then please blog away. It’s a recipe that gives you good material.